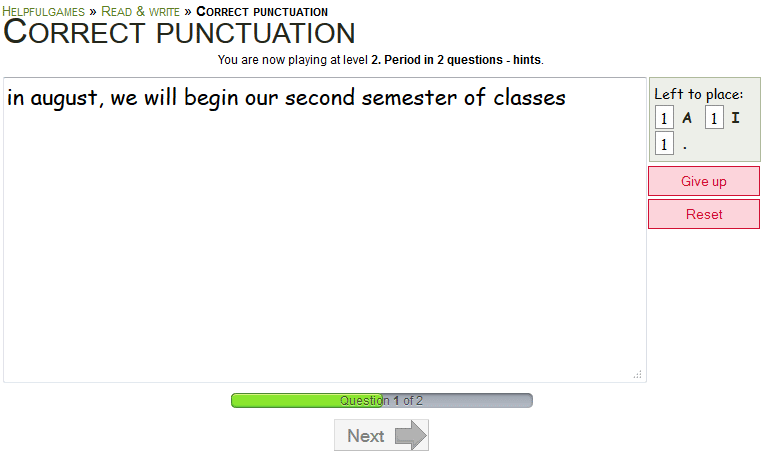 Now there is a new game that let you practice the use of upper case letters and punctuation marks: Correct punctuation. 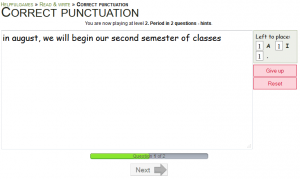 In addition, by playing the game you also practice other punctuation marks; such as exclamation marks, question marks and commas. You have to clean up a text where punctuation marks have been forgotten and all the upper case letters has shrunk to lower case. After you have corrected everything, you can carry on to the next question. If you get stuck, you can always click the button give up in order to reveal the correct answer. This entry was posted in New game and tagged Correct punctuation by Daniel.